I don't like the Windows Vista sidebar that much and think that most applications - also called widgets or gadgets - are pretty much useless. 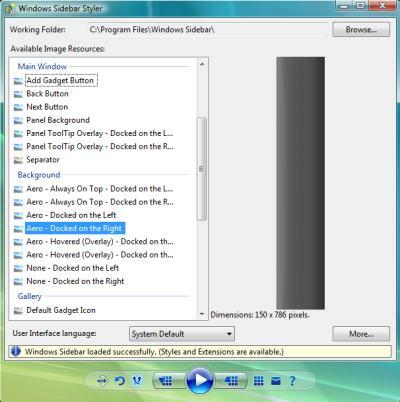 The Windows Vista sidebar styler is a great software for those who use the sidebar and would like to have more options to customize the look and feel of it. Have you ever asked yourself for instance why it is not possible to resize the Vista sidebar? Microsoft creates additional layers if you fill the sidebar with too many applications which are only accessible if you click on the arrows that appear in that case. Not very user friendly in my opinion. The Sidebar Styler lets you resize the sidebar at will, you can increase and decrease the width of it. This disables the page navigation in the process which may mean that you won't be able to see all gadgets if you have a lot of them in the sidebar. Most users however won't notice this at all and if you do, you simply have to resize it again to make them all visible. Since this application is called Vista Sidebar Styler it is able to customize the appearance of the sidebar as well. Microsoft has changed the behavior of the sidebar in newer versions of Windows. The sidebar has been expanded to span the whole desktop under Windows 7 so that the program is not really needed on that operating system. The release of Windows 8 saw the retirement of the sidebar feature, it is no longer available on Windows 8 and Microsoft wants users to use the Windows Start Screen instead. In Windows 8 and newer version of Windows, the sidebar has been removed completely from the system. It is no longer available.